Today i finally got to try out the google sheet add on called Super Quiz. I gave my 6th grade students a quiz on a Google form, then had Super Quiz do an incredible amount of work with the results. Super Quiz automatically grades a form based off of a completed form with the correct answers, then runs a script within your spreadsheet. This is not what makes the add on a game changer. This has already been done effectively with Flubaroo which was a great success last year in my classes. What makes this a game changer is the other tabs within your google sheet that it creates. Here is a list of the other tabs that it creates. The game changing tabs in my opinion are "Auto Feedback Configuration" and "Response Feedback." These tabs allow you to create feedback based on getting certain questions right or wrong. If you separate your form into sections you can now pinpoint where a student struggled and now create an automatic response to send to that student to help them. 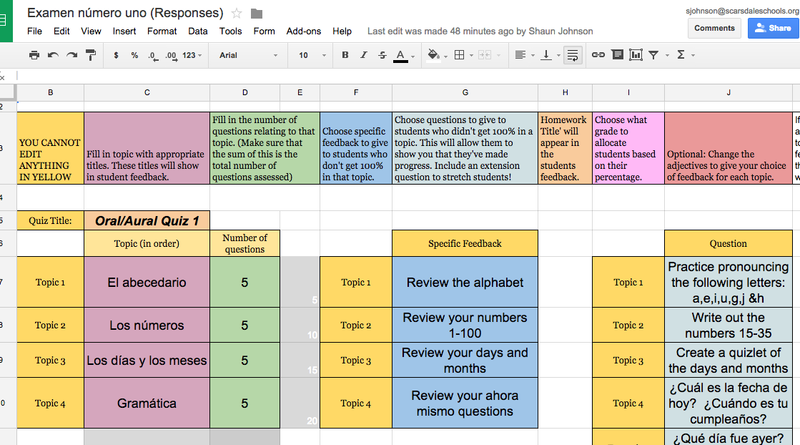 The "Response Feedback" tab then allows you to send emails and share a google doc with this feedback for each student. Now not only are my grades completed in seconds but each student can receive their grade and a breakdown of their score as well. This is really going to improve the efficiency of how quickly I can identify struggling students and how quickly these students can begin to improve. It also puts everything I would have to explain to parents into a nicely formatted doc. Check out the instructional youtube video to see how to add it on to Google Sheets and use it. I strongly recommend giving it a try for yourself.